This is a lovely variety of French Marigold which grows to about half a metre tall before producing masses of small flowers with mixed orange and red petals. Grows for several months before it begins to flower. Each packet contains 100 seeds. Tagetes patula originates from the Americas. The earliest recorded use of Marigolds was by Aztec people who used them in both religious and medicinal practices. The Aztec people begin the cultivation of Marigolds by collecting seeds from plant with large blossoms. Marigolds were introduced into Europe by the Spanish where they were commonly grown around monasteries. Marigolds regained their popularity in modern times after being offered in the seed catalogue of the influential Burpee Seed Company in the United States in 1915 as an alternative for the commonly grown garden asters around at the time for which pests and diseases were increasingly becoming more and more problematic. The Burpee Seed Company was involved in the breeding of many early 20th century Marigold varieties. This particular variety grows to about half a metre tall and produces masses of small flowers with orange to red colored petals. The scent of marigolds is distinctive and can be unpleasant to some people, personally I like the smell. The flowers are edible, the separated petals are a colourful addition when tossed through salads. Marigolds are repellent to bean beetles. Marigolds are well know for their ability control root-knot nematodes by releasing anti-nematode compounds into the soil through their roots. For this reason they are often used as a companion plant to tomatoes which can be susceptible to nematodes. Plant seeds laying flat in groups 17cm apart and about 5mm deep and thin to the healthiest seedling in each group once they have their first set of true leaves. Sow during Spring or Summer in temperate areas or all year round in subtropical and tropical locations. 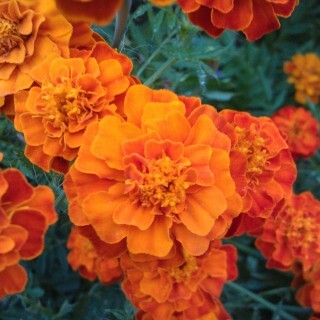 Marigolds are extremely tough and will tolerate a wide range of growing conditions. This variety doesn't seem to flower until it's several months old but when it does it puts on a good display.